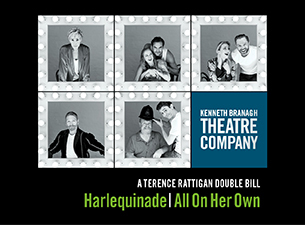 The first season of the Kenneth Branagh Theatre Company begins with a unique Terence Rattigan double bill, as Zoë Wanamaker appears alongside Kenneth Branagh in the rarely seen comic gem HARLEQUINADE, following her performance of the powerfully atmospheric one-woman play, ALL ON HER OWN. HARLEQUINADE follows a classical theatre company whose intrigues and dalliances are surprisingly revealed with increasingly calamitous consequences in an affectionate celebration of the lunatic art of putting on a play. In a striking contrast that displays Rattigan's astonishing range, ALL ON HER OWN tells the story of Rosemary (Wanamaker) who, alone at midnight in London, has a secret burden to share that is at times both heart-breaking and sinister.